They’re back. They’re as hairy as usual – and as hilarious as ever! The Aussie band The Beards have just released their fourth album, proudly entitled ‘The Beard Album’, leaving no doubt about them still being all about the careful maintenance of their facial hair. Sadly, Alexandra Mrozowska was beardless while discussing an album and the band’s unique formula with The Beards’ frontman Johann Beardraven, but somehow they managed to keep the conversation all things beardy. What’s so special about the beards that you’ve decided on making the cultivation of facial hair the “leitmotif” of your entire career? We’ve been asked that question a lot and to be honest it’s hard to describe the magical energy of the beard. I mean, on the surface the reasons are obvious – beards look good, they smell good, they make you instantly manlier and more attractive, they’re a convenient storage location for food scraps… but beneath that, there’s a certain mystical power that a beard has. Having a beard really just makes you feel 100% awesome, like, all of the time. It’s a feeling that only a true beard owner can know. The lyrics on the new album as well as its predecessors are simply hilarious. Is maintaining a beard a never-ending source of inspiration for a bearded lyricist? Yeah, our own beards are pretty inspirational. Plus we just love beards so much, it’s actually not that hard to keep coming up with new ways to express that love, and the fact that we’ve had beards for a long time now means that there’s lots of different aspects of bearded life that we’ve experienced that we can draw on for our songs. We like to have pretty regular writing sessions together, that way we can look at each other’s beards if we ever need extra inspiration. That can have its drawbacks too though – we often get so caught up with staring at each other’s glorious beards that we forget to do any writing. The last album took quite a long time to write because of that, actually. 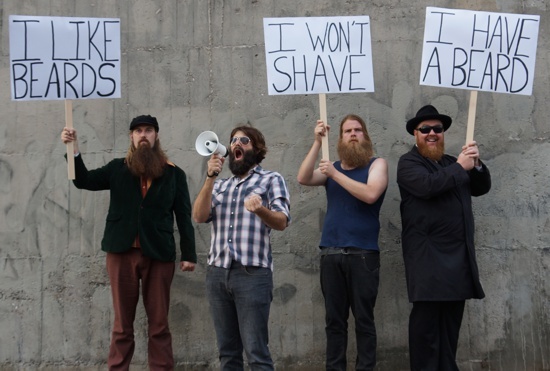 Which of the songs on ‘The Beard Album’ do you think are its strongest points and why? Well, ‘All The Bearded Ladies’ was an important song for us to write, I think. We hadn’t really reached out to the much-ostracised bearded woman before. They certainly deserve as much recognition as the men. Within weeks of releasing it, Conchita Wurst had won Eurovision, so it was pretty much mission accomplished there. Also, ‘I Like Beards’ is a significant track, it really gets back to basics for us and sums up our attitude towards beards really well. And ‘Bit Of My Beard’ contains the word beard sixty-five times, which is a good amount… actually, all the songs are great now that I think about it. They’re great because they’re about beards. Lyrical jokes aside ‘The Beard Album’ is surprisingly diverse music-wise. Is this diversity an attempt to avoid being categorized by the reviewers and listeners? Not really, we like being categorized, as long as the category is “extremely fond of beards”. The musical diversity isn’t really a conscious thing though. When we’re writing, the beard comes first and the music is more or less an afterthought. We don’t really like music that much; too often it gets in the way of the beard. In the past we have tried listening to other bearded musicians for inspiration, people like Cat Stevens or Seasick Steve, but usually it doesn’t do much for us. The problem is that they just don’t write any songs about beards, which just seems like a huge waste of time. Aren’t you afraid the band’s formula becomes repetitive as years go by? I’m sure we will, yeah. Even after the first album people were assuming that we’d run out of ideas but those people tend to underestimate how much we like beards. Although we are starting to run out of words to rhyme with ‘beard’ but I’m sure we’ll think of more. The thing is, as our beards get longer, not only do we become more fervently pro-beard but we also naturally become better musicians and songwriters, so it stands to reason that not only will we keep releasing albums, but that those albums will keep getting better and better as our beards get better. On a side note, our longer beards mean we also become better at other things like wood chopping, changing a tyre, consuming alcohol, stuff like that… it’s science. Soon the bearded crusade invades Europe – the UK included – with plenty of tour dates already announced. What are your expectations? Well, each time we’ve gone over we’ve seen significant increases in the size and quantity of beards at our shows, and this time will hopefully be no different. The biggest beards so far tend to be in Germany and Scotland, so we’re definitely looking forward to getting back to those countries. Plus this time we’re going to Sweden and Norway for the first time and we’ve heard some good things about their beards, so we’re excited about that. Also just being on the road gives us plenty of time to grow our own beards and talk about beards with each other and we get to sing about beards, meet lots of people with beards… it’s going to be a beardy time. What’s the audience on your gigs? Are there any beardless people, or only ZZ Top lookalikes? Well these days the numbers of the bearded in the crowd dominates the beardless, which is great for us when we’re looking out from the stage. We do still encourage beardless people to come to the gigs though, we understand that every beardless face is still a potential beard. Hopefully the clean-shaven in the crowd will get swept up in the beard euphoria and make the life-changing decision to grow a beard. Mostly the beardless tend to stay toward the back of the room, which is lucky, because the sight of someone without a beard can sometimes make our guitarist Facey McStubblington physically ill, but occasionally you’ll get some loudmouth beardless guy who wants to come down the front and carry on. Rest assured we know how to put them in their place pretty quick. Plus there’s always lots of big bearded blokes in the crowd that can sort things out for us. Is there anything you’d like to add, maybe a word or two to encourage the clean-shaved readers to put their razors away? Actually yeah, I would like to say this… no matter what you do in life, the most important thing is making sure you always believe in yourself, follow your own dreams, and don’t let adversity stand in the way of doing what you believe in. Always stay true to yourself, and most importantly, follow your own path and don’t listen to what other people tell you to do. Also, make sure you grow a beard.